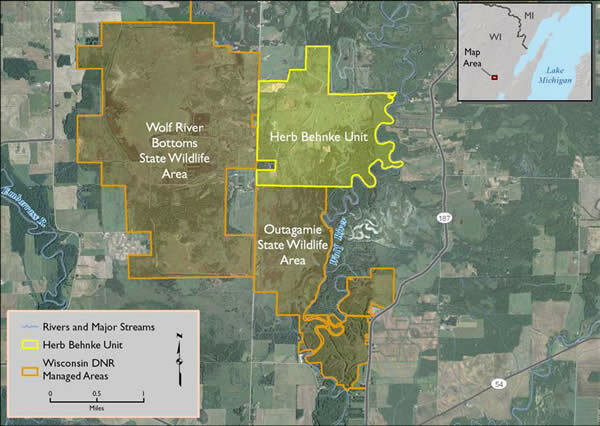 To acquire and protect land within the Wolf River Bottomlands Natural Resource Area. 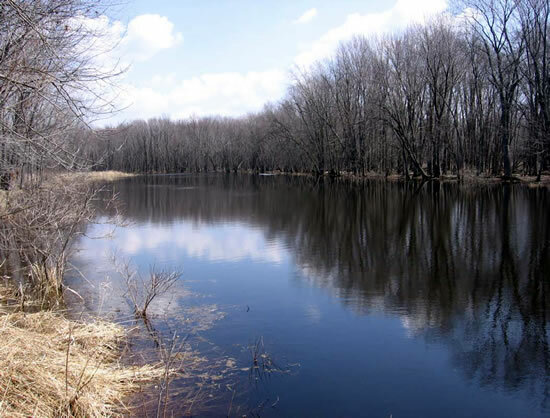 In August 2007, Wisconsin Department of Natural Resources (DNR) acquired a tract of land in the Herb Behnke Unit of the Maine Wildlife Area in the Wolf River Bottomlands Natural Resource Area. The land is contiguous with other protected lands owned by the Wisconsin Department of Natural Resources and provides important bottomland wetland habitat. As a former hunting club, the land was managed for waterfowl and deer and includes an extensive dike system. Additionally, the ditches and floodplains provide important walleye (Sander vitreus) spawning habitat. Wildlife and native habitat benefit from the continued preservation of this land as a natural area. 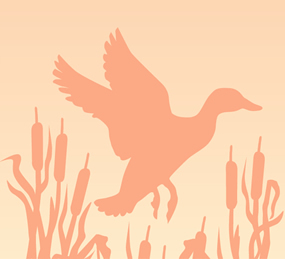 Past management efforts have focused on providing habitat for waterfowl, deer, and walleye. In addition to these species, a variety of native species benefit from protection of contiguous habitat in the larger Wolf River Bottomlands Natural Resource Area. The acquired property is 973.5 acres and includes approximately 1.5 miles of Wolf River frontage. NRDA settlement funds account for 100% of the preserved acreage. NRDA settlement funding was awarded in 2006 and the land acquisition was completed in August 2007. The project received $2,800,000 in NRDA settlement funding. This project successfully protects an important area for wildlife and other natural resources, including protecting water recharge areas and walleye spawning habitat. Because the land has been managed for hunting, it already provides suitable wildlife habitat and will require little additional restoration. The project also successfully increases the total amount of protected contiguous habitat in the Wolf River Bottomlands Natural Resource Area for fish and wildlife species injured by PCB releases.